$1,329,900 1 Bed + Den Church Loft At 260 High Park! Welcome To 260 High Park Condos, Located At High Park Ave & Annette St! Trac Developments Has Repurposed A Historic 20th Century Church, Anticipating It To Be 4 Storeys Tall And Consist Of 77 Residential Units. There Will Be Two Levels Of Underground Parking Spots, As Well As 78 Bike Storage Spaces! On The Fourth Floor, You Will Enjoy Original Cathedral Roofing, Adjusted To Fit Skylights. On The Third And Fourth Floor, Private Terraces Are Provided For Relaxing Or Entertaining A Few Friends! 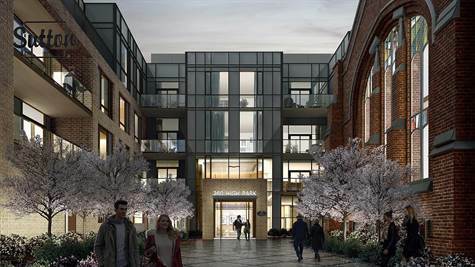 Amenities Will Include A One-Storey Greenhouse, Indoor & Outdoor Amenity Space, Internal Landscaped Courtyard, Lounge, Fitness Centre & Rooftop Patio! Close To Many Parks, Playgrounds, Schools, Fabulous Restaurants & Cafes! An Excellent Walk Score, Close To High Park Subway Station, And A Quick Walk To All Other Transit Sources. Just Minutes From The Gardiner Expressway! Call Us Today For A Sneak Peek At This Amazing Opportunity In Toronto! You Don't Want To Miss Out!